More cranberries! Fresh ones. 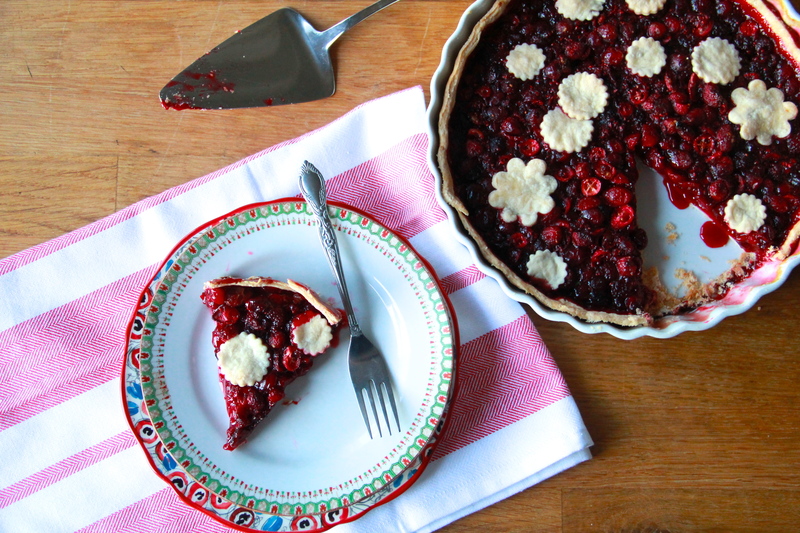 Because they’re beautiful gems and they taste good with raspberries in a pie. 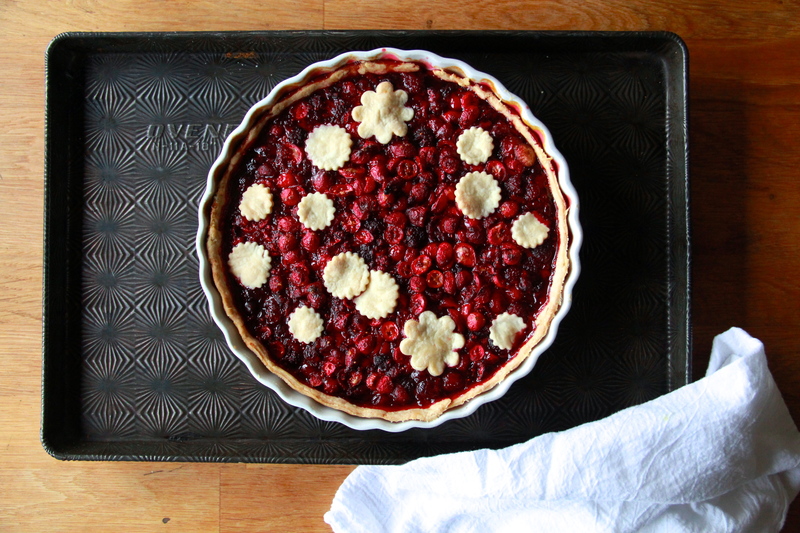 Or a tart? I can’t decide what this is, really. It’s kind of half and half. A halfsies situation. The important question is, do you want to go halves on this thing? I think this little number would make a nice addition to our regular line-up of Thanksgiving desserts. It’s pretty and seasonal and sweet/tart satisfying. It could go in between pumpkin and pecan, maybe? Kitty corner from good ol’ apple betty? 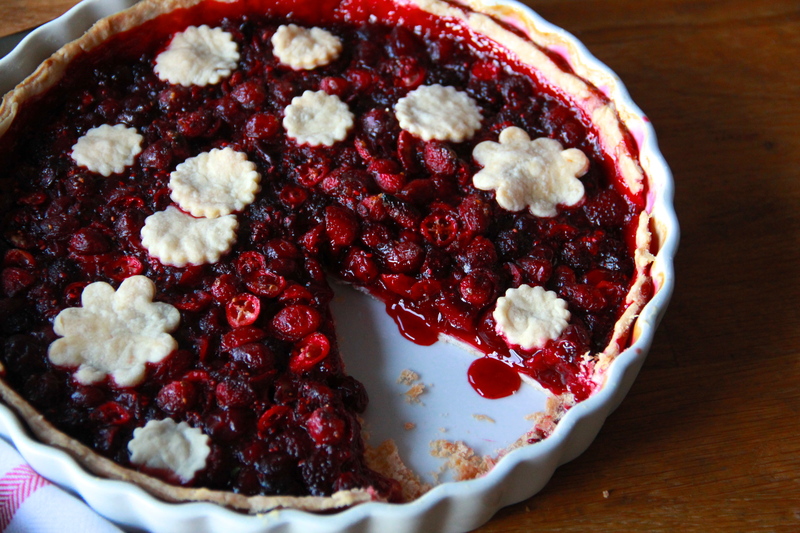 We could call it crazzberry pie. Nice ring to it, eh? The crazzberries taste like crazzberries! …Sorry. I’m excited. Thanksgiving is my favorite holiday! It’s the one time of year that the whole family comes to town and, drinks-wise/food-wise/fun-wise, we go to town. My family is big and loud and kind of nuts, and on Thanksgiving I just feel the luckiest. There’s a lot to be thankful for. Thank you by the way, for being you. For stopping by from time to time and getting chatty in the comments. For you and for so many other things, I am thankful. 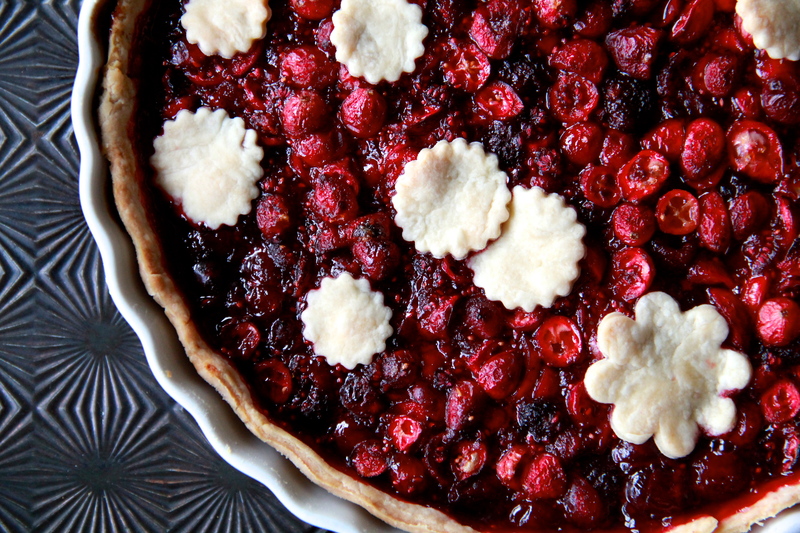 I hope your holiday is filled with love and laughs, and plenty of pie, crazzberry or otherwise. They key to the success of this recipe is taking the time to slice the cranberries in half and then macerate them in a good amount of sugar. This step ensures that essential sweet/tart balance of the final pie product. 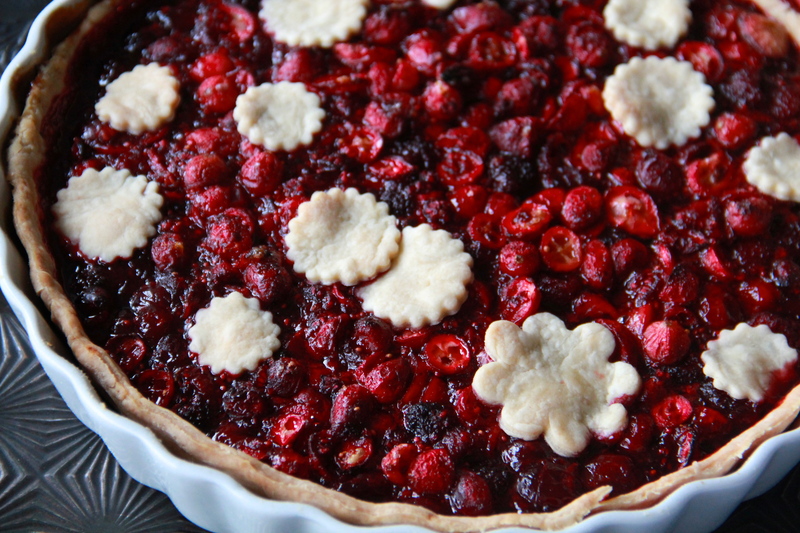 If you skip the step and leave them whole, the sugar will have trouble penetrating the thick skin of the raw cranberries, and your pie will suffer from sour-city syndrome. Cut them berries. Also, I like frozen raspberries here, since fresh ones aren’t in season. I imagine you could successfully use fresh if you’ve got them, though. To make the dough, combine the flour, salt, and sugar in a large bowl, either by hand (with a whisk) or in the bowl of a stand mixer fitted with a paddle attachment. Add the cold butter and work it into the dough (with your hands or the paddle), until there are pieces of butter of various size throughout the mixture (sizes should range from lentils to hazelnuts). With the mixer on low speed (or stirring with a rubber spatula), slowly add the chilled water until the dough comes together (it shouldn’t be too wet, but should clump together when squeezed). Gather the dough into a disc, wrap it tightly in plastic, and chill in the refrigerator at least 1 hour (and up to 2 days). While the dough chills, prepare the filling: cut the cranberries in half, and combine them in a bowl with the sugars and orange zest, stirring well to coat the cranberries in sugar. Allow the cranberries to macerate in the sugar for an hour, stirring occasionally. Heat the oven to 350 degrees F. When the dough has chilled, roll it out on a well-floured surface into a large circle, 1/4- inch thick. Gently transfer the dough into a 9-inch pie or tart pan, pressing it into the bottom and up the sides of the dish. Either fold and crimp the edges or use a sharp knife to cut around the edges of the dough, forming a blunt crust (if you choose the latter, you can re-roll the scraps to make a few decorations for the top of the pie). Put the pie dish in the fridge to chill while you finish getting the filling together. Once cranberries have macerated and soaked up most of the sugar, stir in the frozen raspberries, cornstarch, salt, orange juice and vanilla. Pour the filling into the prepared crust, distributing everything evenly and smoothly. Top with pie dough decorations, if using. Bake the pie for 50-60 minutes, until the crust is deeply brown and the filling looks darker and thick (it will still be quite jiggly when you remove it from the oven, but will thicken and firm up once cool). Allow the pie to cool completely before slicing it up and serving. The pie will keep in the refrigerator for about 3 days. Looks delicious and so pretty!!! Happy Thanksgiving! This pie is beautiful. I love how red it is. Can’t wait to try this one. It’s so pretty!